My two-year-old son’s feet dangle when I place him up on the white, tiled countertop. Beside him, I’ve assembled ingredients for our banana bread: Flour, eggs, bananas, sugar, melted butter, baking soda, salt, and vanilla extract. He immediately reaches for the eggs. “Crack egg, mama?” he asks with a smile. He (with help) peels the very ripe bananas and places them in a big mixing bowl. We mash them together. Next, I scoop sugar into a measuring cup, which he pours into the bowl. We do this with all the ingredients. He gets to crack his eggs. I get to scoop out the pieces of eggshell he has deposited in the bowl. He goes at the mixing bowl with his colorful, plastic whisk. Of course, I have to give the ingredients a true mixing once he finishes, but it’s worth it to watch him feel as if he’s a valuable asset in the kitchen. This is what it’s like to involve your kids in your cooking adventures. It’s a hassle sometimes, yes. It invariably takes longer to cook anything with your child’s help, but the benefit to you and your child is incredible: You build an amazing bond while fostering their independence. This is never truer than on holidays, where special kitchen adventures abound. Thanksgiving, a day dedicated to thankfulness, cooking, and indulging in special family meals, offers the perfect opportunities to cook with your kids. I hear you. But, I’m here to convince you that involving your kid in your Thanksgiving cooking could potentially create a less stressful holiday. Why you should cook with your kids on Thanksgiving? In my experiences, cooking with my kids has reshifted my focus. It serves as a way to reset the — sometimes overwhelming feelings that come with the pressure to deliver a perfect dinner to many guests, all while trying to create a day full of mindfulness, gratitude, and lasting memories with your family. Involving your kids in the kitchen means foregoing perfection, but the tradeoff is worth it. You’ll be calmer, more present, and you’ll end up building beautiful holiday memories of cooperation for your children to look back on for years to come. More than that, it can be near impossible to wrangle children brimming with holiday excitement while also balancing the many steps and ingredients needed for multiple recipes. So, make them useful and keep them occupied! Cooking with children of all ages fosters their independence and confidence, and teaches them a valuable, practical life skill. Start them young, and they just might be able to help with the “heavy lifting” in the kitchen on future holidays. What can kids contribute to the Thanksgiving table? How you involve your children in your Thanksgiving prep will depend on their age and maturity. Safety, of course, should be your priority. Keep very young children away from hot cookware, ovens, and stoves. Ensure they’re not in grabbing distance of any hazards, like hot liquids or sharp knives. Everyone should wash their hands, too! We wouldn’t want to send our guests home with a virus on top of their apple pie. Mash anything — Hello, mashed potatoes! (Just be sure to cool the potatoes before handing your kiddo the masher). Scoop and pour ingredients (You might want to lend a helping hand to minimize messes). Chop fruits, vegetables, and other ingredients (with children’s or small knives). Measure ingredients (yay, math practice!). Find ingredients in the cupboard or fridge. Older children can essentially help you with most tasks, and can possibly even follow a simple recipe with minimal supervision. Be sure they know safe practices for cooking on the stove or in the oven. So, which Thanksgiving recipes are kid-friendly in the kitchen? Here are a few recommendations. Yes, right off the bat, I’m recommending you involve your children in making the centerpiece of the meal: The turkey! Why? 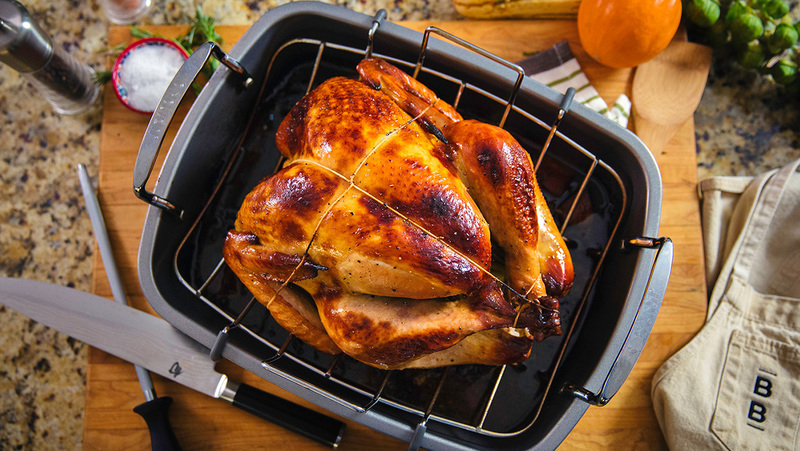 You know that sense of pride that fills you when you roast the perfect turkey? Let your kid get in on that, too. The brining part of this preparation is the perfect place to involve young children, as it involves no chopping. Let them pick sprigs of thyme and rosemary, and help pour pre-measured apple cider and maple syrup. You should handle the simmering of the brine. Older children can learn to truss the bird, and season the turkey and its cavities. This hearty potato, cheese, and bacon “pudding” is bound to be a kid favorite, so let them help make it. Young children can whisk eggs, cream, and seasonings. Children aged five to 10 can shred onions and potatoes (or operate the food processor if you teach them how). Older children can fry the bacon till crisp and chop it up once it’s cooled. Fun fact: If your children help cook a dish, they’re more likely to eat it. So have them aid in this healthy, vibrant succotash and feel good that they’re learning to appreciate their veggies! Children over five can dice delicata squash and onions, and throw in pre-shelled edamame and cut-off-the-cob corn. This recipe is so simple, actually, that older children might be able to follow it all on their own. If you’re ready to hand off some real responsibility, leave them in charge of this Thanksgiving side dish and catch some likely well-earned relaxation time. Image at top via Photo by Hannah Tasker on Unsplash.